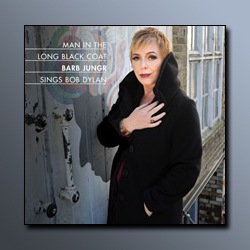 6moons.com music reviews: Barb Jungr "Man in the Long Black Coat"
May 2011 Bob Dylan turned 70. Barb Jungr whose love affair with Dylan’s songs spans over a decade felt the occasion perfect to dedicate an album to that special relationship. What differentiates Jungr from the many who plunder other singers’ creativity is that love affair - the fact that she has invested years of her emotions into those songs and made them part of her repertoire and records all along while injecting her own sensibilities for a result that's initially disturbing then revelatory. Unless you are trying to get a quick hit on the charts or secure a piano-bar gig, singing Dylan is probably the second most risky task a singer can take (the first being trying to escape Yoko Ono’s lawyers should a singer venture to hum one of Lennon’s songs in the shower). Everybody knows Dylan. Everybody has an idea of how each lyric should be sung, what emotion should transpire. Opportunities to fail abound, success is always tainted by the afterthought that "it's Dylan’s songs that made everything possible". Jungr’s interpretations of timeless classics like "The Times they are A-Changing", "Just Like a Woman" or "Like a Rolling Stone" will show you a completely different face of Dylan’s work - if you let them. Jungr does not choose contrast for the sake of contrast. If you listen carefully you will eventually notice that her musical choices give those songs a different meaning. She picks jazzy tones, cabaret or blues not for the sake of style but for the new meaning they impart. That said it is actually her fragile and threadbare interpretations of "Man in the Long Black Coat" and "Sara" that completely won me over. You are free to disagree but I actually believe that on those two Jungr went beyond contrasting her interpretation with Dylan’s. I believe she found new and unexplored depth. I challenge you to listen to her "Sara" without being transported. I don’t think anybody could. I love Dylan. And I have to say, I love Jungr’s take on Dylan just as much. I did not think that possible so I bestow on the Man in the Long Black Coat a Blue Moon award for achieving the impossible and giving us a revelatory read on the great Bob.